Time will tell. A story is a conspiracy until proved otherwise. I’m sure that Tom will unreservedly apologise personally to you Robeson if he is proved wrong; will you apologize unreservedly and politely if he is proved right? This is yet another example of cronyism, if not corruption – and we all stand around hardly believing that the snouts in the trough have so much contempt for people, institutions and society. Or it could be that they just want to reduce the cost in having all that data online. I am sure those sites were being prepared before this came out. Not everything is a conspiracy. TASTE seems to be run by a save the earth company..
best recipes is run by..??? James, relative hosting costs are so miniscule in this instance that they’re essentially non-existent. BBC Food is first in Google UK for “Food”, amongst thousands of other search terms. The value of this kind of brand-awareness far outweighs any insignificant hosting costs. Reblogged this on Recipe Resources. 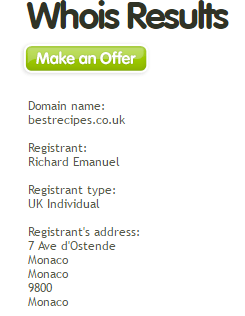 taste.co.uk = 213.86.51.225 appears to be registered to COLT, a UK ISP. How is this connected to Sainsbury’s again? Ah, contact details are http://www.akqa.com/work/ , a digital agency. dralanwilson That’s the IP address that the domain resolves to, not the domain itself. So not sure how you came up with it about to launch a site. How exactly do you arrive at the conclusion that the Gov’t has FORCED the BBC to remove these recipes? There’s certainly no evidence of it in the article linked. Taste was originally a joint venture between Carlton TV and Sainsbury’s, but it flopped and in 2001 was closed down with all assets (and presumably the URL) returning to Sainsburys. Not seen any mention of it re-launching anywhere. What’s the source for this? They say it costs too much to run two websites.. So they are cutting the one that is in keeping with their Charter – containing NO adverts – and keeping the one that has paid advertising on it.. And fewer recipes. Obviously, it’s about privatising.. Again! The Tories are hellbent on extracting everything of value that has been built up by taxpayers over decades and stuffing the lot into private pockets. They are not ‘saving’ money for taxpayers they are making money for themselves. While I deplore the way the Conservatives are backing the BBC into a corner, I don’t think the notion that withdrawing the BBC recipes is some sort of a cunning plan to help Rupert Murdoch take over the world. In the first place, I see no reason why the BBC has to completely junk its recipes altogether. Why not just transfer them over to http://www.bbcgoodfood.com/recipes ? A specialist site, all about food, with its own recipe section – and funded by advertising, not by the licence fee, so doesn’t have to abide by government-enforced cost savings. An ideal alternative berth, which neatly takes the recipes out of the argument. If they’ve got to go somewhere, why not here? In the second place, the assumption that the demise of BBC recipes will leave a massive gap into which the likes of Rupert Murdoch can slickly insert themselves is just that – an assumption. The web is absolutely stuffed with recipe sites, including…. …and so on. There are more – many more – than those I’ve listed, but I think that lot illustrates my point. If you want to see more, Google ’em up, like I did. So even if the BBC recipe site vanished tomorrow, it would not leave a particularly big gap in the market. If anything, I’d say the market is already overcrowded – it could probably do with a bit of thinning out. It’s not like there’s an easy prize here for an opportunistic entrepreneur. And in the third place…it’s not happening now, anyway. Panic over, everybody. Conspiracy theories back in the box…. Anyone can set up a recipe website. It’s a simple enough task for any competent web developer. That’s precisely why it’s not something that the BBC should be wasting public money on. Yes, Mark Goodge, as a more than competent web developer I could put a recipe site together fairly quickly, though it would be pretty useless without the recipes to load into the database. The BBC has invested in thousands of them, perhaps that’s worth spending money on, whether you think that’s a waste or not is up to you, but I think it’s a waste not to utilise a resource that has been built up at the licence fee payers expense. i just went online to save all of my favourite recipes from the BBC site and found they were actually on BBC Good Food Magazine which is an entirely separate website and not being closed down. I think it’s a shame this happening – there is a public service in being able to look up a recipe used on the telly – but the internet is awash with great recipes. My niggle is that most recipes on the net are in US english – we’ve gone metric and don’t use “cups” to measure – and we dont have access to half the US ingredients. It isn’t just hosting costs – it is a massive database that needs to be maintained on a daily basis, using resources – each article needs to be written and tagged. Still think it’s a shame – perhaps more of an ideological cut. Well it’s in line with their policy of let’s keep making the rich richer – vested interest decisions. First they came for the Muslims, and …. If you’re going to start a new a conspiracy theory then you really ought to make it about something a bit more interesting than a recipe web site! Here’s a suggestion…. How about one where the world is controlled by alien lizards? @aaagreenman – I ignored the entry because the author seemed to think who “THEY” are was irrelevant and so not worth mentioning. Did he mean the Tories, the BBC, the ‘Establishment’, Rupert Murdoch?…… or maybe alien lizards! Add this to the list http://goodfood.kitchen seems to have also taken advantage of the of the pending vacuum with another recipe food website. I don’t always agree with the BBC and have felt that we are paying too much for a TV license that we have no say in where the money is spent. I don’t particular want my money spent on BBC pursuits of interest that are broadly covered by other websites equally or much better, and would rather it utilized for their TV programming and the news.